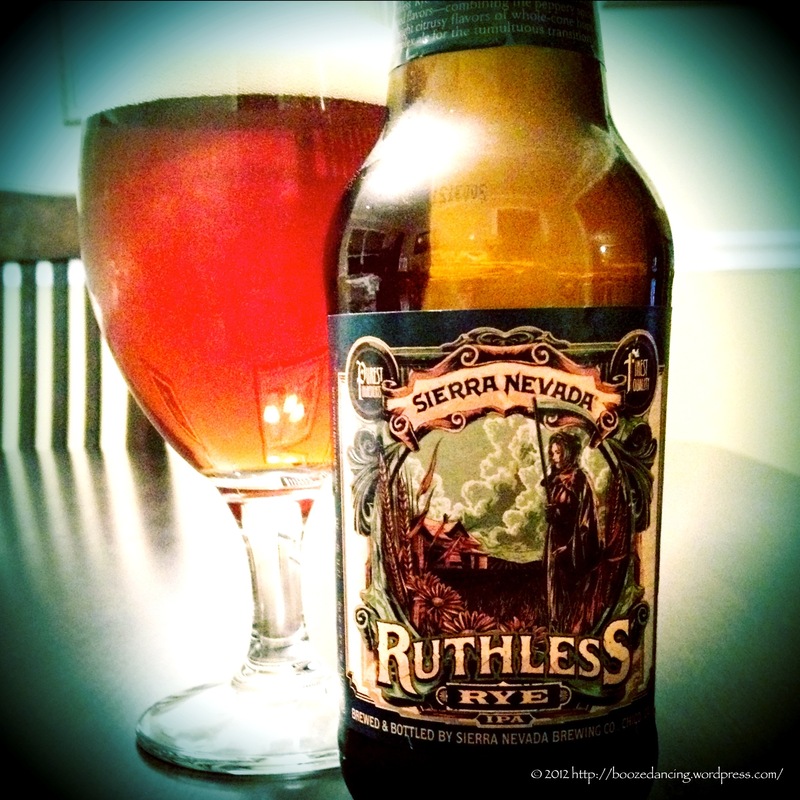 This is my second time drinking the Sierra Nevada Ruthless Rye. My first experience was during a Sunday night drinking session at The Pourhouse in Westmont, NJ (FYI, I still haven’t figured out if these Sunday night drinking sessions are a great way to end the weekend, or a bad way to start the work week). Since I had the Ruthless Rye along with two other beers, I didn’t take the time to fully evaluate it. I definitely liked it, but did I love it? Keep reading and you’ll find out soon enough. Rye has been a staple grain for millennia—sought after for its stubborn resilience in the field and revered for its unique flavor. Ruthless Rye IPA is brewed with rustic grains for refined flavors—combining the peppery spice of rye and the bright citrusy flavors of whole-cone hops to create a complex ale for the tumultuous transition to spring. Appearance: Rust orange color. Thick, fast rising head that settles down to a quarter inch of tan foam. Lots of sticky lacing remains on the glass as you drink it down. Aroma: Grapefruit zest. Some spicy rye notes. A bit of yeast. A plethora of hop goodness! Taste: Moderately carbonated. Smooth and creamy mouthfeel. Citrusy hop flavors in the beginning with just enough malt sweetness to keep things in balance. The bitterness intensifies a bit at mid palate, but the citrus hops and subtle sweetness never go away. Pleasant bitter finish that lingers for a minute or two. Lacks the astringency of other rye beers. Thanks to its healthy balance of rye spiciness, hop bitterness, and malt sweetness, I found the Ruthless Rye IPA to very enjoyable, and it might even be the best Sierra Nevada beer that I’ve ever had. Ruthless Rye is a delicious beer from start to finish, and it’s also an excellent value at around $10 per six pack. Have you tried this beer yet? Let us know your thoughts in the comments below. Wow! I haven’t tried it but I want to! Best Sierra Nevada is high praise. I love the Torpedo IPA. I will be picking up a six pack of this soon. Sierra Nevada has a very solid line-up. I had a sip of the Torpedo this past Friday night. Was pouring it for a friend (Mrs. Alemonger) and definitely liked what I tasted (Sadly, I only had one bottle. The downside to the mixed six when you pick a good beer). As far as this one goes, I really enjoyed it. Let me know what you think once you get to try it. My shop didn’t have this, unfortunately (no so easy to shop around in PA). I ended up with a pack of Torpedo instead. I don’t think I’ve ever had a rye beer, though, so I was curious. I’ll have to keep my eye out. Any other recommendations for widely available ryes? Thanks guys! I did see Founder’s Red’s at the place I went yesterday, but I didn’t feel like shooting from the hip with my first rye beer purchase (and the picture on the box creeped me out…). I have one more beer shop I can check out too (yes, there are a whopping TWO places I can buy six-packs in PA). Founder’s is quickly becoming one of my favorite breweries. Though I don’t love all of their beers, most of their line up ranges from very good to excellent. And yes, that is one creepy label! Great beer though. Where are you in PA? Hey guys, I stopped into my other shop this morning (at Whole Foods) while grocery shopping, and they had the Bear Rep. Hop Rod, which I am now sampling for the first time. It’s good. Great hops, and maltier than most IPAs. If I didn’t know there was rye in it and you gave it to me blind, I probably wouldn’t guess that it was anything different from just a hoppy, malty IPA. There is something that’s not quite “bitter” but not quite “spicy” either. I guess that’s the rye. All in all, I’m not blown away but it’s good! I’m more impressed with the fresh hops in this bad boy than the rye I think. Thanks for the tips! I am in the NW suburbs of Philly, BTW. Ahhh… so we’re practically neighbors! Cool! Glad to hear you enjoyed the beer. It is very very good. How’s this for a possible description of the Rye factor… it adds some earthiness to the beer. That’s a cool photo. Ruthless Rye sounds like a keeper to me. Isn’t it a new seasonal? I haven’t tried it yet, but it’s now on my “list”. Sierra Nevada opens their east coast brewery in 2014. That will make it easier to find more of their selection in the eastern US. I’m looking forward to touring the new brewery and tasting their brew. PS. Check out our free e-book and beer mag. Thanks Dave! I believe you are correct. This is a seasonal release. Have they announced where they will be opening? I haven’t been paying attention that closely. The chosen location is in the Blue Ridge Mountains, near the French Broad River and about 12 miles south of Asheville in Mills River, NC, a town with a population of about 6800. They project to open the brewery in April of 2014, followed by a restaurant and gift shop. I wrote up an article about it on our site, if you have time, please come on by. Ahh. Thanks for the info Dave. I’ll be sure to check out your article. I love the menacing chick on the label art. She reminds me of something from “the walking dead”. I’m not a rye-p.a. fan, but I’ll give this a try (if I can find it). 1 – Sudsy Sunday at the Pour House is both a great way to end the weekend and an awful way to start the work week but like so many things in life you need to experience pain to know joy. 2 – This in NOT the best beer that Sierra Nevada makes. It’s good but falls short when compared to the likes of Torpedo, Kellerweis, etc. Not to mention the DFH collaboration Life & Limb. Best Sierra Nevada? No way. 3 – Being a rye beer nut I think this beer falls short of the sticky peppery spice that I love about rye beers. It’s a good beer, maybe a great beer, but not a great rye beer. 4 – This one, like most brews, was better on tap. I bought a 6pack after we had it at the Pour House and thought bottle version lacked the brightness of the draft version. In summary this is a good solid IPA but not a great Rye IPA. Don’t get me wrong I liked this beer. If given a choice between this and other average IPAs I’ll choose this. If given a choice between this and other average Rye IPAs I’ll choose the others. This is mild for a Rye IPA and perhaps a good “gateway” Rye beer for those not ready for some of the Rye monsters out there. 1 – Agreed. Although Monday mornings can be a bit painful after a Sudsy Sunday session, it would take some strong words from a medical professional to make me pass them up whenever the occasion arises. How often do I really pass up an occasion to imbibe? I would say not very. 2 – I have not had the entire Sierra Nevada line up and have only briefly sampled the Torpedo (I liked that brief taste very much and hope to explore it further). If I had to rank what I’ve had so far, I would go with the Ruthless Rye first, then a toss up between the Bigfoot Barleywine (fresh not aged), and the Kellerweis. The Pale Ale and others are very good, but I find these three to be a bit more special than the rest. Life & Limb is very good too, but it’s not something I want to drink very often. 3 – I assume that you are referring to beers such as the Bear Republic Hop Rod Rye and the Terrepin Rye Squared. I agree that they are both excellent beers and are definitely more intense from the Rye side of the equation when compared to the Ruthless Rye IPA. The Ruthless Rye leans towards the hop side of the equation. 4 – I’m not sure whether this was the first, second, or third beer that I had on draught that night. I definitely liked it on draught, but I tend to get overwhelmed when we start sampling multiple beers in one sitting, so the subtle flavors were lost on me (was this Terrepin Moohoo and Sixpoint Resin night?). If I didn’t like it, I wouldn’t have bought a bottle to review. A fair and well balanced response Herr Wookie. I did have the Sixpoint Resin on the same night, my last brew of the evening, but I am not sure if you did also. I am not sure if the Moo Hoo made an appearance that night. I tend to stick to similar beers during these sessions so as not to have one beer throw off the taste of another. I suggest you do the same. Nah. That would conflict with my food and beverage ADHD. Nice to see that Ruthless Rye brought out a ruthless fighting spirit between you two (G-LO & The Wookie). I’d like to say that you’re both wrong but, alas, my principles won’t allow it. I think it’s difficult to objectively evaluate most (if any) Sierra Nevada brews without recognizing and factoring in the huge historical contribution they’ve made to the entire craft beer industry. Some believe they are the grandfathers of craft brewing (perhaps alongside their Norther Cal craft beer buddies at Anchor). Whether they started the “craft beer movement” or not isn’t really material but yu have to acknowledge their immense and positive influence. SN Pale was the original and for many, many years, the iconic West Coast Pale. To be sure, others have taken the torch and made it burn far brighter but SN deserves the historical accolades it gets. For that reason, I’ve always found it difficult to review their beers as objectively as I would, say anything from Southern Tier, Lagunitas or any other legitimate craft brewer. Is Ruthless Rye a good beer? Yes – I really like it. I think I’d say the same if it came out of a little-known brewery in New Hampshire or Texas. Extremely well-balanced, crisp, flavorful, dry spicy finish, looks good in the glass. All the components you look for in a top notch craft beer. Is it Sierra’s best effort? For me it’s near the top – especially for what I assume will be a year round standard brew. It doesn’t knock their Celebration Ale off the pedestal as my favorite SN brew but it’s got a some lofty real estate near the upper outcroppings. I was also very impressed with their Exportation Ale – the one the sent to a European finishing school to rest in old Cabernet oak barrels before coming home. Had that one during Philly Beer Week last year at Fergie’s Pub (alongside G-LO and Wendy of DFH while Fergie was doing some demolition of one of his tables with the H.O.G.). Of course, that was a one off brew so it really doesn’t count but it does show that the classic and staid boys out in Chico still have some creative game in them. And with that I’ll leave you with the following extra-contextual sentence: On second though, maybe I won’t. As always, nice comment! Lucid too. As Limpd would say, “Sounds like you’re on your meds today.”. I just had a bottle and I have to concur with G-Lo. This is might be the best beer in the Sierra Nevada lineup. Not as painfully rye as some beers, the Ruthless is just a nice, well-balanced rye.